This packaging is at least 83% lighter than the bottle equivalent, so it's easier for you to carry home and, as it requires less energy to transport, it's lighter on the environment. A medium-bodied wine rich in mulberry, cherry and plum flavours, with subtle spiced oak characters and a juicy finish - perfect with lamb, beef or mushroom based dishes. This great value product is easy for you to carry and store. Perfect for everyday, dining at home or social occasions with family and friends. This wine is sealed in an airtight bag, so it stays fresh for up to 6 weeks after it's first opened. Hardys Stamp celebrates our family's rich wine blending heritage to deliver you great tasting wines in true Australian style. Stamp is one of Hardy's most recognised wine ranges. Released in 1988, the unique labelling features original Australian postage stamps which date back to 1937. Hardy Stamp realises Thomas Hardy's vision of creating vibrant wines reflective of the Australian style and enjoyed around the world. 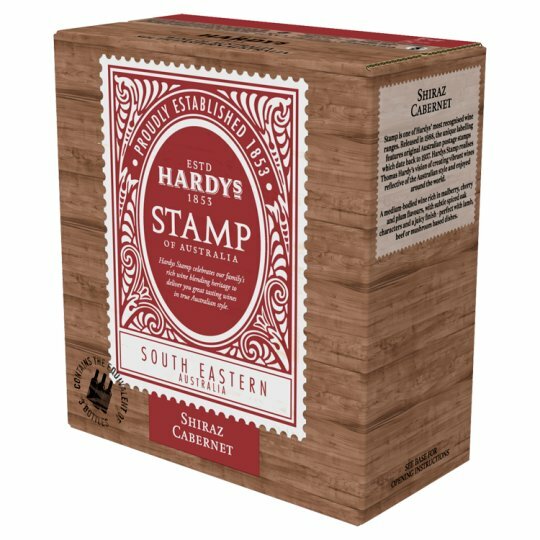 Hardys Stamp Shiraz Cabernet is a blend of two classic grapes - rich flavours of cherry and plum with hints of spice and oak. Fermentation in stainless steel tanks, with some American oak influence during maturation. Hardys Stamp showcases our winemakers' blending skills, both from diverse regions and grape varieties, to produce outstandingly delicious wines. Stamp is at the heartland of the Hardys brand and one of the most recognised wine ranges.